Having normal spinal sagittal balance is vitally important to human health and specifically physical health. Normal sagittal balance basically can be described as having normal upright ,posture. Normal upright posture includes your head centered over your shoulders, your shoulders centered over your hips, and your hips centered over your ankle. 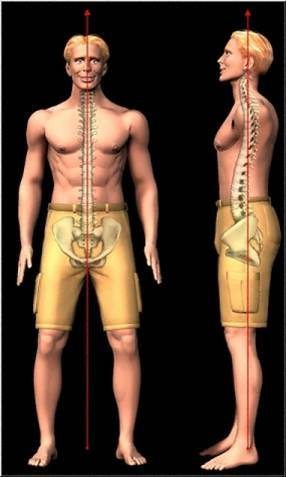 Structurally we can measure normal sagittal balance by comparing your upper cervical spine to your pelvis. The sagittal plane is posture form the side.We have been preaching the importance of proper sagittal balance since the mid 1990’s and finally the medical world is catching on. Spinal surgeons are currently attempting to fix sagittal imbalance through spinal fusion. Many of them understand the important role spinal balance plays in spine health and many surgeons believe the only way to fix it through fusion. If you read this site at the Columbia University Medical Center department of Neurosurgery you will think the only solution to fix sagittal balance is through surgery, they are wrong. They are ignoring the many studies, like this one, that chiropractors have published that show we have a way to fix sagittal balance that does not place the patient under the same risks that surgery has. Including studies by non-chiropractors who utilize the same protocols as in this study published by MD’s from Egypt. Proper sagittal balance is vitally important to living a long and healthy life; we understand that, and even the spine surgeons are realizing that. Why continue with therapy that keeps you going but never fixes your posture which is the underlying cause of your problem? Why wait until all that you can do is have surgery,? and surgeons really are fusing the entire spine to fix posture. Start your road to better health by calling us today.